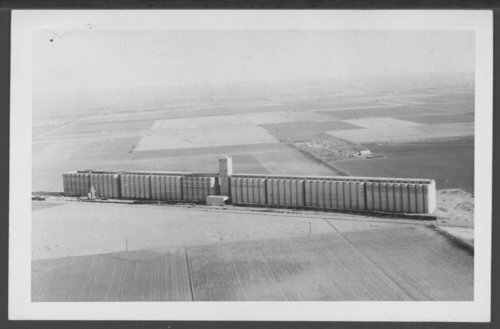 This postcard shows an aerial view of the 14 million bushel grain elevators owned by the C-G Grain Company in Wichita, Kansas. The postcard was addressed to Mr. Clifford Hope in Washington, D.C. A note on the back indicates the elevators were southwest of Wichita, near the Mid Continent Airport. There is a printed message on the back with a handwritten note from R. H. Garvey that says "Aren't Elevators Beautiful!"